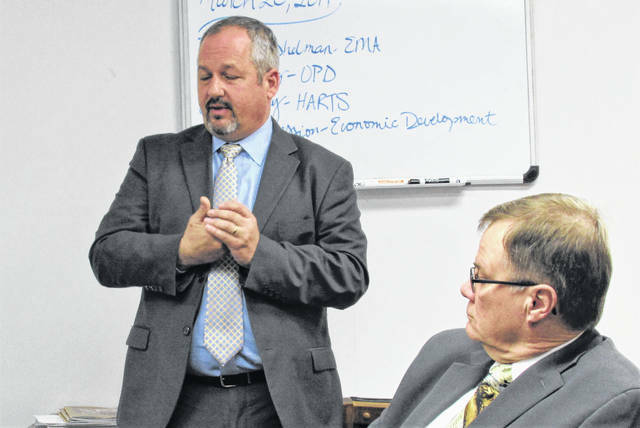 Tim Young, left, of the Ohio Public Defender’s office in Columbus, presented Wednesday to the Highland County commissioners what his office could offer to help with the county’s legal costs for indigent defense. At right is Highland County Common Pleas Court Judge Rocky Coss. The Highland County commissioners met Wednesday with Tim Young of the Ohio Public Defenders (OPD) office who explained what his office does and offered suggestions at how it could help with legal costs to the county. He said that estimates of 70 to 75 percent reimbursements to counties would be made if the final budget is approved, and that his office reimburses any state-level case and state-level charge in municipal, juvenile or common pleas court as long as it’s under the Ohio Revised Code. ● Appointed council system, where the courts maintain a list of qualified legal counsel and a qualified person is chosen. Rates and amounts being paid are a set figure, with bills processed and approved by the judge and auditor before being sent to the OPD for reimbursement. ● The county sets up its own public defender office, where an office and commission is established so that for a county the size of Highland County, up to four lawyers are brought on staff to cover the various courts and caseloads. Court-appointed counsel would still exist since in his estimation, about 10 percent of felony and misdemeanor cases are in conflict and close to 50 percent are in conflict in juvenile cases. He explained a case that is “in conflict” stems from incidents where two people have committed a crime together and the law prohibits a lawyer from representing them both. ● Hiring a non-profit group of lawyers to provide legal services for a set fee with case caps built into the contract. ● Enter into a contract with the Ohio Public Defenders office, where it sets up a county office that is maintained by the State of Ohio. He said 10 counties employ that model at present, with four of them in southeast Ohio. ● Establish a joint county public defender’s office, where Highland County would connect with an adjoining county to set up a joint office. He said this was the least popular and adopted model, and has been done only one time in the history of the public defender system. Commissioner Gary Abernathy said the meeting with the OPD office was an attempt to hear options based on recent changes that came to light from meetings commissioners attended in Columbus. “Our conflict cases, which he mentioned, are more than 10 percent, so I don’t think it would work here,” she said. Highland County Emergency Management Agency Director David Bushelman expressed concerns about a trio of pending legislation that he felt would undermine the integrity and neutrality of not only the local EMA office, but EMA offices throughout the state. Ohio House Bill 27, he said, would remove certain immunities from prosecution for police and fire departments when they are operating emergency equipment. If approved, the bill could open up lawsuits being filed against emergency personnel in the performance of their duties, Bushelman said. He said the other aspect of the bill concerns the neutrality his office enjoys concerning grant funding, with the fear being that any monies would be redirected from EMA to whatever department the agency would be under, such as the sheriff or fire department. The last item on Bushelman’s list involved a reduction in funding for the Multi-Agency Radio Communications System Administration Fund (MARCS) found in House Bill 64, which if passed would double the fees charged for the 700/800 MHz radios the office uses. In an matter, Joe Adray, mobility manager for the Highland Area Rural Transporation System, briefed commissioners on his agency’s plans to bring a local public transporation system to Hillsboro and Greenfield. As previously reported in The Times-Gazette, he said a $20,000 grant to conduct a feasibility study has been received and there are hopes the system could be up and running within a year, pending approval from the Ohio Department of Transportation. The grant came from the Ohio Valley Regional Development Commission and a study is being conducted by Carpenter Marty Transporation, with offices in Cincinnati and Columbus. Adray said that in the beginning, tentative plans are for “deviated loops” around Hillsboro and Greenfield five days a week, twice a day, plus trips to and from Hillsboro and Greenfield. He said that the cost for a ride in the Hillsboro or Greenfield areas would possibly be $1, and the cost of a trip back and forth between the two towns would possibly be $2 or $2.50. Between now and the fall, HARTS will announce public meetings and will notify city councils in an effort to inform and receive input from everyone. Also Wednesday, commissioners signed off on 10 resolutions, eight of which were line item budget transfers while the remaining pair dealt with the appointment of Mark Axmacher to the Highland County Airport Authority Board, and the other was an award to Lindsay Precast by the Highland County Engineer P. Dean Otworth for reinforced concrete box culverts. Two contracts were approved, one between the county engineer, commissioners and Rinker Materials for storm sewer pipe, and the other was an addendum to a subsidy grant agreement. In other matters, before entering into executive session with representatives of Hecate Energy Highland, LLC, commissioners approved an end-of-session resolution suspending their Monday morning meetings through the month of April, starting March 25. The next scheduled commissioners meeting will be Wednesday, March 27 at 9 a.m.